LOS ANGELES (CelebrityAccess MediaWire) — Nederlander Concerts will produce a series of concerts benefiting the Griffith Park Recovery Fund (GPRF) at The Greek Theatre kicking off on September 6 with The Goo Goo Dolls, which will headline the beneit benefit concert to support the recovery efforts in Griffith Park after the devastating fires which scorched more than 800 acres. 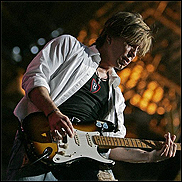 Nederlander Concerts invited The Goo Goo Dolls to headline this concert and close their summer tour in Los Angeles, which resulted in moving their June 19 show. All tickets from the June 19 show will be honored on this new date and a portion of the revenue will be donated to the GPRF. "The restoration of Griffith Park is extremely important to us as well as the City of Los Angeles and we are fortunate to have the first-ever GPRF concert headlined by superstar rock band The Goo Goo Dolls," said Alex Hodges, chief operating officer of Nederlander Concerts. "This will be the first of a series of concerts allowing the community to give back to the city and restore the beauty of Griffith Park." "We are honored to headline such an important concert and kick off this concert series at The Greek Theatre," said John Rzeznik, The Goo Goo Dolls front man. "We are so excited and appreciative of Nederlander's commitment to our Griffith Park Recovery effort," said Councilmember Tom LaBonge. "When The Goo Goo Dolls take the stage, we'll be there wildly applauding as we will for any and all bands and individuals who want to help restore the greatest urban park in the country."